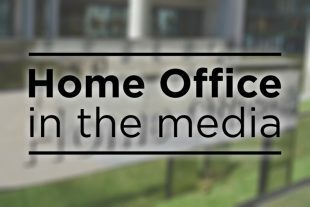 Today’s Home Office media stories include reports that ageism could become a hate crime under a review of the law, asylum seekers rights, and coverage of the latest report from Migration Watch on skilled workers permits. There is widespread coverage in print and broadcast media noting that ageism could become a hate crime under a review of the law announced today by the Home Secretary. Figures published today show hate crimes have risen again, doubling to more than 80,000 since 2012-13, of which 63,000 involved race and 9,000 sexual orientation. The Telegraph and Mail report that the Home Secretary has asked the Law Commission to investigate whether ageism and misogyny should be recognised as hate crimes in the same way as offences motivated by hostility based on race, religion, sexual orientation or disability. The Guardian reports that goths, women, elderly people and men could be protected by hate crime laws after officials announce a wide-ranging review of the legislation. The Express notes that criminals who prey on the elderly could soon be treated like “racist thugs” and face longer jail sentences. The Guardian highlights other measures announced by the Home Office, including extending its Places of Worship scheme, saying that a further £1.5m of funding is to be provided to groups such as the Anne Frank Trust and Kick It Out, which work to challenge prejudice. Hate crime goes directly against the long-standing British values of unity, tolerance and mutual respect - and I am committed to stamping this sickening behaviour out. The Guardian reports that asylum seekers blocked from working in the UK could make a net contribution of £42m to the economy if restrictive rules are lifted, according to a new coalition group. The Lift the Ban coalition is calling on the Government to give asylum seekers and their adult dependents the right to work after waiting six months for a decision on their claim. It highlights that the Home Office aims to process initial asylum claims within six months, but 48% go beyond the target. According to the article, members of the public would be broadly supportive of lifting the ban on work, noting that polling organisation British Future finds that 71% agree it would help integration if asylum seekers could work after six months of waiting for their claim to be processed. Once an individual has been granted protection, they have immediate and unrestricted access to the labour market. However, asylum seekers are not normally allowed to work while their asylum claim is determined, this is to protect the resident labour market and ensure access to employment is prioritised for British citizens and those lawfully resident here, including refugees. Those who would otherwise be destitute are provided with free, furnished accommodation and are provided a cash allowance to cover other essential living needs. The Times reports that immigration could “soar” if the Government adopts proposals to reform rules for skilled workers coming to the UK after Brexit, according to a report by Migration Watch. The paper notes that the report made recommendations including expanding the skilled work permit system to EU workers, abolishing the cap on numbers and lowering the skill level required for permits. After we leave the EU, we will take back control of our borders and put in place an immigration system that works in the interests of the whole of the UK, ensuring that we continue to access the skills and talent that the UK needs. However, we remain committed to reducing net migration to sustainable levels. We are carefully considering the Migration Advisory Committee’s recommendations and we will be setting out our plans on the UK’s future immigration system in the coming months.